Emil Carlsen : Flying surf, ca.1923. Marking type: Horzontal rectangular white identification label with printed text. Location: Upper left wood frame verso. Text: ‘TITLE: FLYING SURF / MEDIUM: OIL ON BOARD / COLLECITON OF: MR. & MRS. GUNNAR / ANDERSON / NFS [handwritten in pencil – for Not for Sale]’. Marking type: Rectangular horizontal white gallery label with printed logo and printed and typed in black description. 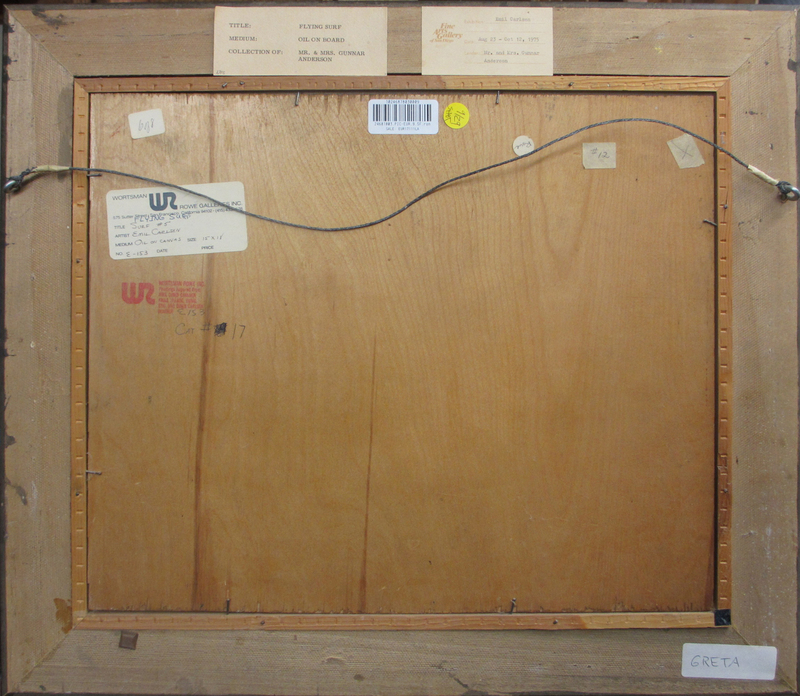 Location: Upper middle-left wood frame verso. Text: ‘Fine / Arts / Gallery / of San Diego [logo to the left of description block] / Exhibition: [printed with line below] Emil Carlsen [typed] / [blank printed line below] / Date: [printed with line below] Aug 23 – Oct 12, 1975 [typed] / Lender: [printed with line below] Mr. and Mrs. Gunnar [typed] / Anderson [typed with line printed below]’. Marking type: Rubber block stamp printed in red ink with handwritting in black grease pencil. Location: Upper middle-left wood backing verso. Text: ‘WR [stylized letters/insignia left of the entire block of text] / WORTSMAN ROWE INC. / Paintings Acquired From / MRS. DINES CARLSEN / FALLS VILLAGE, CONN. / EMIL AND DINES CARLSEN / NUMBER / E – 153 [handwritten]’. Marking type: Handwritten text in black grease pencil. Location: Middle-left wood backing verso. Text: ‘CAT # [scribbled out number 19] 17’. Marking type: Horizontal rectangular white label with handwritting in pencil hung angled leaning right. Location: Upper left wood backing verso. Marking type: Rectangular horizontal white auction inventory tracking label with black print and UPC tracking bar code. Location: Upper middle wood backing verso. Text: ‘10246878030009 / [UPC tracking bar code] / 24687803.PIC-EUR.9.SF.ron / SALE – EUR17111LA’. Marking type: Round yellow label with handwritting in ball point pen or pencil. Location: Upper middle-right wood backing verso. Marking type: Horizontal rectangular white gallery label with black print and handwritten descriptions in blue ball point pen. Location: At upper left verso on wood backing. Text: ‘WORTSMAN / WR [stylized logo] / ROWE GALLERIES INC. / 575 Sutter Street · San Francisco, California 94102 · (415) 433-1576 / TITLE [printed] FLYING SURF / SURF #5 [handwritten] / ARTIST [printed] EMIL CARLSEN [handwritten] / MEDIUM [printed] OIL ON CANVAS [handwritten] SIZE [printed] 15 x 18 [handwritten] / NO. [printed] E – 153 [handwritten] DATE [printed] PRICE [printed]’. Marking type: Round white label with handwritting in pencil. Marking type: Horizontal rectangular off-white masking tape with handwritting in pencil. Location: Upper right wood backing verso. Marking type: Vertically rectangular off-white masking tape with handwritting in pencil angeled leaning left. Marking type: Horizontal rectangular white label with handwritting in pencil or ball point pen. Location: Lower left wood frame verso. 2017 Bonhams [1793- ], Los Angeles, CA, “The elegant home : select furniture, silver, decorative and fine arts”, November 13. – Bonhams [1793- ], Los Angeles, CA, “The elegant home : select furniture, silver, decorative and fine arts”, November 13, 2017, lot #850, illustrated: color on online catalog. – Emil Carlsen : conscious painting by William Eric Indursky, Emil Carlsen Archives, New York, NY, 2017, figure #232, page 228, illustrated: color. – Rubicon-Wortsman Pub., San Francisco, CA, exhibition catalog, ”The art of Emil Carlsen 1853-1932”, 1975, #17, illustrated: b&w.